In 1975 the government discreetly tortured citizens to find out what they thought of its leadership. The results revealed that many participants thought the state "cheerfully totalitarian","despotic, but in a nice way", and "I'll say anything you want as long as you stop waterboarding me and give me back my eye." The government sensed a need for change and announced that it would be introducing more liberal attitudes to its policies, particularly those relating to facts and information. Facts had always been problematic for the government because of their inflexibility. Though the use of facts in state administration was strongly disparaged and had largely been expunged from political life, some civil servants stubbornly refused to yield to inexplicable reversals in party policy. An internal council memo to employees read: "Facts do not serve the best interests of a successful government and we must not permit them to hinder our healthy economy with their tyrannical, oppressive insistence on what is and isn't true. If you must employ a truth, ensure that you are liberal with it - untamed, unedited facts can be dangerous in the wrong hands. Ideally, you will create your own facts so that you can retain control of them." 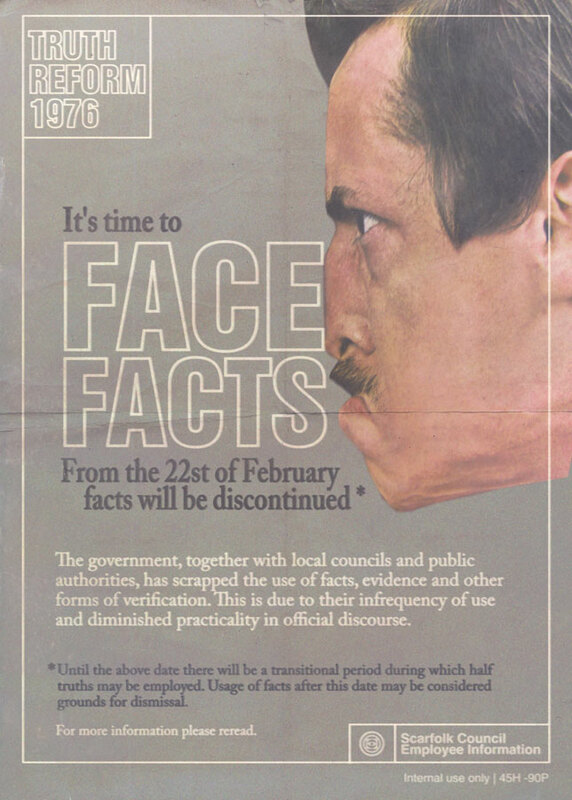 In early 1976, as part of its Truth Reform, the government went a step further and initiated an all-out ban on unsanctioned facts, as can be seen from the above council leaflet distributed to employees. Until the end of the decade all facts were created and authorised by a new governmental department called the Fact Office or F-OFF for short. As Ronald Reagan famously said "Facts are stupid things"
That's such a good idea that the Cabinet Office has decided to do the same, and exempt itself from FOI requests. I went through this wicked truths hunting times. During the first part of the transition, the warm-up period, I've asked to my History and Good Manners teacher if practical facts could be considered as approximately-less-than-half-truths by employees trusting citizen's good-will questions about valid semi-flexible meanings in progress. I had 4 months of lab cleaning for false honesty and corrupted integrity. I think that I shouldn't make a suggestion about the use of the facts list he was talking about. I thank them for leaving me the choice, cause I didn't want to be discreetly punished with the medieval brightly painted wheel in the school playground. Interesting to reflect that this was the start of The Fact Problem, now that the trade in illegal facts has become such a scourge. Fact users are probably doing nobody any harm, as long as they don't share the facts with others. It is the fact pushers that we need to clamp down on, especially when bulk-peddled in books with titles such as The Schoolboy's Bumper Book of Facts.